Studer's Call Management System CMS is a well established and recognised System which works on a 'best practice' level. After only a short training period, anybody is able to use the CMS system. At the heart of the system is a voice server that can handle the entire gamut of telecommunication formats, from analogue POTS circuits, through ISDN, to the latest voice-over-IP technology. The system's main job is to automatically manage and distribute calls to clients used by reporters and operators working in studios and editorial offices. There is unified messaging support for voicemail, faxmail and SMS. The entire system is under straightforward software control, managed by client application that is installable on any number of networked PCs. Users do not have to be concerned with distinctions between analogue, ISDN, or VoIP telephone traffic, or indeed a mix of all three. 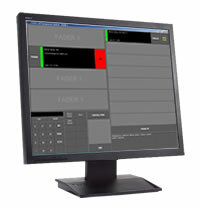 The Studer Call Management System handles VoIP telephone traffic with ease. 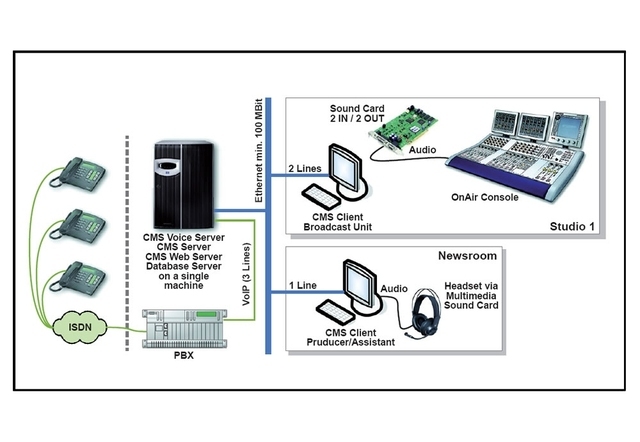 With Ethernet connections, the voice server can control and distribute up to 240 channels either directly or via holding areas to broadcast studios, editors' desks, or operators. There are virtually no limits to call patching and management via holding areas. Standard audio cards (e.g. Digigram VX222) provide a two-way interface with the audio world. The Studer Call Management System can of course handle calls on analogue telephone lines. In this scenario, the voice server manages up to four analogue telephone hybrids per studio or audio workstation via networked, programmable control units that are operated via the same software client. Up to 120 channels can be connected with the voice server via an ISDN adapter and managed/ distributed using voice-over-IP. Again, operation is via the same client that controls VoIP and analogue telephone lines. Not only does the Call Management System provide virtually unlimited control over telephone traffic, it also handles related peripherals like signal lamps, studio red-light installations, and other items of broadcast equipment that need to be controlled in tandem with communication systems. Connected to a telephone network that suports caller ID (e.g. ISDN), the Call Management System can also be linked with directory services. This allows focused analysis of caller demographics, which offer major benefits for gaming and voting applications. Version 2.0 software adds new functionality. CMS is highly integrated in Studer’s famous OnAir3000 Console. In addition to the well known and unique function of label sharing with the OnAir3000 and Route 6000, the new appearance gives you the look and feel as if you were working on Studer’s OnAir3000 itself. The intergration level is even higher if you run CMS on one of the switachble OnAir3000 channel screens. The Graphic User Interfaces have been improved in order to give the user maximum work effectiveness. All applications are in fullscreen mode to use the maximum area of the screen. 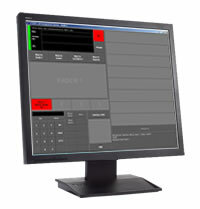 The producer client is able to telemonitor all studio clients in order to have an overview of which caller is connected to which studio’s fader. The Operator can pre-select a dedicated fader and can move a certain caller from the waiting room directly to the pre-selected fader. If you have an extensive Gameshow, which usually provides many callers in the waiting area, you can give certain waiting rooms high priority in order to have these callers always at the top of the waiting area list. Sometimes it might be desired to give different anncouncements to the callers whether you disconnect all callers or only a single caller. The new version gives you more flexibility to assign different announcements to different actions. It is now possible to have more than 8 CMS faders in the fader section. Furthermore, it is possible to mix more than 1 CMS caller together on one fader on your mixing desk. All members of this party can talk to each other via pre-talk multiplexing. Your waiting rooms have opening hours! You can decide the range of date and time during which your waiting room should be active or when it shouldl be closed. Futhermore, you can decide if the caller should hear an announcement or a live audio stream, if he can speak to your mailbox, or if you want to give him simply a busy signal. You can listen to the recorded messages of the answering phones easily via your Internet Browser. If you want to run a voting system, you can simply announce the number to the listeners, the rest is done by CMS. After the voting has closed, you can read the results with your Internet Browser or the DJ can have the live results directly displayed on his Studio Application. If you run a game, you can have the caller answer a question before he’s allowed to enter the waiting room area, from where you can take him on-air. This function is very useful if you cascade several questions to make a pre-selection of callers you want to have finally on-air. CMS needs only a standard IT environment to run upon. All applications, database and possible updates are managed centrally. This helps to ensure cost effectiveness and ease of handling of the whole system.